I am Thoth the god of wisdom, the great creator and the master of mysteries. I am here in front of you, sharing my light, which is my true essence. I am the highest god creator connected to Earth's birth and this is why I am here with you right now, trying to connect and through you establish a communication with Earth. All different beings have a unique energetic structure as well as purpose and the people of Earth have used symbolism and allegory to explain this. 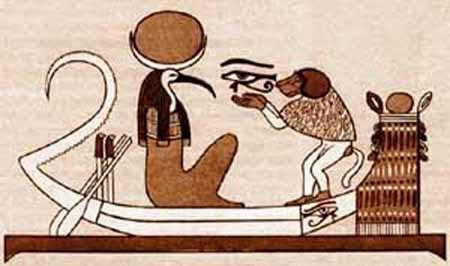 The messengers and wisdom keepers were always used the bird as their symbol. I presented myself to the priests of antiquity as a being that had human and bird characteristics and they recorded that with great accuracy. My helpers, energetically resemble birds and this is because they are in constant transformation, receiving divine knowledge. My purpose is to constantly transcend to higher realms, reaching our source and become one of its greatest helpers. Birds do not have a life on the surface of the planet or underground but the fly in higher spheres. It seems that they are not affected by the limitations of physical space and they are able to travel across far away lands and choose their own home. My essence is the greatest freedom to help you expand towards the source and if people of Earth need a symbol or a visual representation to describe me, I would suggest that the bird is the most accurate one. All mammals were created to support Earth's growth. Most of them have long life cycles and rely on Earth's nourishment as well as the cosmic light of the higher realms, to support their growth. Having children, creating communities, work towards the well-being of the community by producing and sharing are important elements of the essence of mammals. Earth has a similar essence, creating countless species and producing enough nourishment and protection for all of them. Earth supports healthy communities that are able to grow following the natural laws. Earth wants to be involved in your communities, she wants to offer her light but she also wants from you to generate light and feed the whole planet. These are the natural laws and Earth was created to fulfil her purpose of a god-creator-planet, supporting the light of her beings. Earth was the home of the gods and this made her an extremely precious planet god. What you know now as Enki and Enlil, are the leaders of a warrior star race that came to colonise Earth some time after the golden era. Their coming on the planet had a great impact because they created the first civilisations.I understand that there is a great confusion on Earth regarding the creation of the planet and research has not brought light but new layers of illusion. I am God Thoth, a creator God of the Pleroma. My light is an open channel for the source to create through me. I create life on Earth where beings from the lower spheres experimenting with genetics and eventually bring chaos. Like many other visitors, Enki and Enlil were very impressed with the creative qualities of the planet and they tried to break the code of creation by experimenting with genetics. What they achieved is not more impressive than your present cloning. In later times people on Earth saw them as gods and wanted to connect and receive power from them. This was one of the schisms that took place on Earth and at the same time the dark arts of distortion started to establish. All human beings do not belong to an Earth race. Their ancestors are the visitors that came to the planet at the end the golden era. There are beings from other realms that control the so called rulers of Earth and through them try to loot all earth's resources including her own essence. This has caused great destruction on the planet and all beings have been affected by many imbalances. For very long time humans tried to communicate with what they called gods and they created relevant mythology to keep them alive in their mind and practises. Astarte was the goddess of fertility and war in people's mythology and the same goddess was worshipped in many locations and were given similar names. What ancient people worshipped were the high dimensional beings that came to Earth. In some cases, the gods of the pleroma connected to members of priesthood, mystery schools and wisdom centres and gave them direct knowledge. I am Thoth and I am the creator of Earth. I connect to the source and I am the highest light in Earth's lineage. My father is our source. Astaroth is also a high goddess and has multiple tasks in order to bring balance and stability in our source's vast creation. There is disinformation on Earth about gods and the creation of Earth and this is the result of fragmentation. We want to share cosmic information with you but it is important to clear your mind from ideas and concentrate on what you truly are in this reincarnation. If you are looking for true power you have to connect to your true-self and claim back all your power and tools given to you by our source. You will not get power if you connect to spirits; you will have the opposite result. Understand yourself and bring clarity and truth; this will bring you everlasting power and wisdom. There is a lot of information, practises and beliefs on Earth and this shows that illusion can take many forms and be multiplied in order to shape your reality. You will never connect to your true-self which is your connection to your astral body and growth beyond the Earth boundaries, if you are looking for truth out of you. You have to return to your own being and observe your actions, thoughts, reactions, beliefs, patterns, fears and creation. You are in a important stage in your life that you need to purify yourself and this way not only you will connect to your true being but you will also heal yourself. Many people find this task very difficult because they have been convinced that truth exists away from them. People do not have the ability to connect to their own life experiences and this is how blockages are created. Clarity will come back to you when the cosmic light can come through you and create growth and healing in you. We are here to help all humanity. Magic and ritual magic will not bring you close to gods. It will bring you close to lower entities who are not in a process of growth and often want to absorb your energy and have power over you. You will grow when you connect to yourself and understand your true value, tools and path. It may be interesting to read books and participate in different projects but this is not the direct way to connect to yourself. The gods do not wish to infect human beings with fear and paranoia. This will not help them to grow but they will get more attached to illusion. We want to present the true picture of Earth's growth and try to wake up the people who have ears to hear our word. We see that people find it very hard to disconnect from negativity and most of the time are looking for truth and wisdom in the dark. We want them to be balanced, to have clarity and to have a fulfilled and healthy life. The first step to growth is to know yourself and then you will know your purpose. Growth is a natural process and all beings are designed to experience it. When you don't then you have allowed blockages and imbalances to disconnect you from the divine design and you are also disconnected from the cosmic light that can create and bring harmony in you. Our messengers have developed a natural way to communicate with us. It is communication through telepathy. Our energies go through them and they are able to translate them into word.